When Heat Stroke Strikes, Cool First, Transport Later : Shots - Health News To stop deaths from heat stroke, specialists say athletes and the rest of us should ease into a new sport, drink extra fluid, and — most importantly — get cool fast when body temperature spikes. 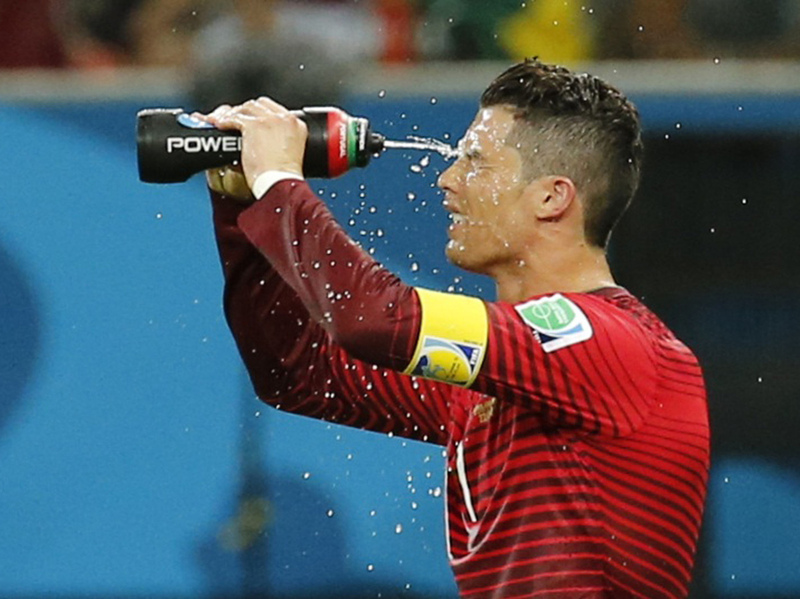 Portugal's Cristiano Ronaldo takes a water break during the 2014 World Cup soccer match between Portugal and the U.S. in Manaus, Brazil, on June 22. The first-ever World Cup water break (taken during the game between Portugal and the United States this week) is a reminder that we all need to take extra precautions when playing in the heat. Sports-related heat injuries and deaths continue to rise nationally, according to estimates by the National Athletic Trainers' Association; the Centers for Disease Control and Prevention cites heat stroke as the leading cause of death and disability among high school students. Those deaths are preventable, both groups agree, if the right precautions are taken. Almost all heat stroke deaths happen within the first three to four days that people are out doing something new. The athletic trainers' group announced updated guidelines Friday that detail exactly what needs to change. The update stresses the importance of hydration, heat acclimatization and body cooling. And though the guidelines were written with athletes in mind, they can be applied by anyone who hopes to stay active during the summer months, the athletic trainers say. "The biggest change is the concept of cool first, transport second," says Douglas Casa of the University of Connecticut's Korey Stringer Institute. The research institute was named for the former Minnesota Vikings player who died of heat stroke in 2001. Heat stroke strikes when a mixture of physical exertion and weather causes body temperatures to soar to 104 degrees Fahrenheit or higher. Casa says that once body temperatures reach these extremes, irreversible cell damage can set in if the temperature isn't brought down fast — within a 30-minute window. This 30-minute interval can easily be eaten up by the time it takes to call an ambulance and transport a patient to the hospital. So the new guidelines say forget the ambulance and concentrate on cooling down the victim — a cold water bath works best. The guidelines also say that easing into a new sport during the summer months — to give the body time to adjust to the unfamiliar physical demands — can help prevent the condition. "Almost all heat stroke deaths happen within the first three to four days that people are out doing something new," says Casa. He also urges athletes not to lose sight of their overall health when training in hot weather. Dehydration, sleep deprivation and sickness can all force the body to work harder during exercise, increasing the chances that its internal temperature regulation will fail. "Heat stroke occurs among young, healthy individuals who push themselves beyond the point of stopping because of peer pressure or organizational requirements," says Lawrence Armstrong, a professor of physiology at the University of Connecticut. "But the deaths from exertional heat stroke are totally preventable."